This volume supplements Volumes 63, 64, 87, and 249 of Methods in Enzymology. 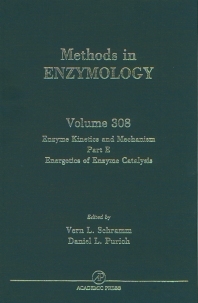 These volumes provide a basic source for the quantitative interpretation of enzyme rate data and the analysis of enzyme catalysis. Among the major topics covered are Engergetic Coupling in Enzymatic Reactions, Intermediates and Complexes in Catalysis, Detection and Properties of Low Barrier Hydrogen Bonds, Transition State Determination, and Inhibitors. The critically acclaimed laboratory standard for more than forty years, Methods in Enzymology is one of the most highly respected publications in the field of biochemistry. Since 1955, each volume has been eagerly awaited, frequently consulted, and praised by researchers and reviewers alike. Now with more than 300 volumes (all of them still in print), the series contains much material still relevant today--truly an essential publication for researchers in all fields of life sciences. Biochemists, biophysicists, molecular biologists, pharmacologists, and analytical, organic, and medicinal chemists. W.W. Cleland and D.B. Northrop, Energetics of Substrate Binding, Catalysis, and Product Release. C.T. Grubmeyer, J.W. Gross, and M. Rajavel, Energy Coupling through Molecular Discrimination: Nicotinate Phosphoribosyltransferase. T.S. Leyh, On the Advantages of Imperfect Energetic Linkage. D.E. Coleman and S.R. Sprang, Reaction Dynamics of G-Protein Catalyzed Hydrolosis of GFP as Viewed by X-ray Crystallographic Snapshots of Gia1. D.L. Purich and F.S. Southwich, Energetics of Nucleotide Hydrolysis in Polymer Assembly/Disassembly: The Cases of Actin and Tubulin. K.S. Anderson, Fundamental Mechanisms of Substrate Channeling. D. Dunnaway-Mariano, Intermediates and Energetics in Pyruvate Phosphate Dikinase. H. Deng and R. Callender, Raman Spectroscopic Studies of the Structures, Energetics, and Bond Distortions of Substrates Bound to Enzymes. G.K. Farber, Crystallographic Analysis of Solvent-Trapped Intermediates of Chymotrypsin. A.S. Mildvan, T.K. Harris, and C. Abeygunawardana, NMR Methods for the Detection and Study of Low-Barrier Hydrogen Bonds of Enzymes. S. Shan and D. Herschlag, Hydrogen Bonding in Enzymatic Catalysis: Analysis of Energetic Contributions. A.J. Kresge and D.N. Silverman, Application of Marcus Rate Theory to Proton Transfer in Enzyme-Catalyzed Reactions. V.L. Schramm, Enzymatic Transition State Analysis and Transition State Analogues. P.J. Berti, Determinin Transition States from Kinetic Isotope Effects. B.B. Braunheim and S.D. Schwartz, Computational Methods for Transition State and Inhibitor Recognition. Daniel Lee Purich has been at the forefront of biochemistry research for more than 25 years. He was awarded the National Institutes of Health Research Career Development Award from 1977–1982, the Plous Teaching Award (the University of California Santa Barbara Campus-Wide Teaching Award) in 1977, has been a member of the National Institutes of Health Biochemistry Study Section from 1982–1985, and a member of the Journal of Biological Chemistry Editorial Board from 1981–1986. He has been a member of the American Society of Biological Chemists, the American Chemical Society, the New York Academy of Sciences, the Biochemical Society, and the American Society for Cell Biology. Dr. Purich is currently a Professor and Chairman of the Department of Biochemistry and Molecular Biology at the Florida College of Medicine. He is the author and editor of numerous scientific publications.